Location: Swan Mountain Ranch is nestled in what is known as the Swan Valley, just 7 miles south of the quaint village of Swan Lake, Montana. The Base Camp for Swan Mountain Outfitters is also located in the Swan Valley about 12 miles further down the road than the Ranch. The Swan Valley lies in the heart of the Rocky Mountains between the Swan Mountain Range and the Mission Mountain Range forming the western edge of the Continental Divide. About your host at Swan Mountain Outfitters: Pat & Joanne Tabor, Owners. Swan Mountain Outfitters is owned and operated by Pat & Joanne Tabor. Ever since Pat was in his teens, he always dreamed of owning an outdoor recreation company. Pat has been fishing and hunting all over the world for the last 25 years. After working for many years in the corporate world, Pat and Joanne decided they needed to focus on making their dreams a reality while they were still young enough to make it happen. Today, they feel privileged to reside in the beautiful Swan Valley of Montana at Swan Mountain Ranch. Often described as a “new generation outfitter”, Pat is focused on providing top quality customer service for the guests of Swan Mountain Outfitters and uses the best equipment, techniques and trip planning strategies that create the best adventure itineraries and experiences today. Over the last 35 years, Pat has been a client of over 36 outfitters located all over the world. Pat will tell you, he has been with some of the best, and unfortunately, some of the worst. This collective experience has enabled him to identify the attributes of many of the finest outfitters and bring this knowledge to Swan Mountain Outfitters. This expertise, combined with his strong business acumen gained through almost three decades in the corporate world, makes Pat unique among Montana outfitters. Hunting experience at Swan Mountain Outfitters: Swan Mountain Outfitters provides guided free chase big game hunts in Montana on both private and public land throughout the Northwest. We offer: mule and whitetail deer hunts, archery elk hunts, archery whitetail hunts, wilderness elk hunts, wilderness multi-weapon hunts, wilderness combination big game hunts, spring and fall black bear, horseback hunts, lodge hunts, mountain lion hunts, moose hunts and goat hunts. Swan Mountain Outfitters is fortunate to have, based on our hunting permits, access to thousands of acres of the Flathead National Forest, in and around the famed Bob Marshall Wilderness. 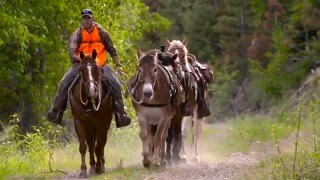 Big Game Hunting in western Montana takes place primarily on remote lands owned by the Flathead National Forest, the State of Montana, and private timber companies. Swan Mountain Outfitters has under permit hundreds of miles of public hunting ground being the only commercial Montana hunting outfitter with permits to hunt big game such as: mule and whitetail deer, elk moose, goat and lions in this area. While we employ highly skilled and experienced guides, these big game hunts are very challenging and do not carry guarantees of the harvesting of game. If the thought of going home without of an animal is not palatable to you, do not book a hunt! Click here for quick link country guide.